Ever had a day when there’s just one irritation after another? Nothing in and of itself that makes you want to crawl back under the covers. But, put it all together, it’s one big annoyance. Many of us face those kinds of days frequently, when things are beyond our control and we’re just dealing with what’s thrown at us. 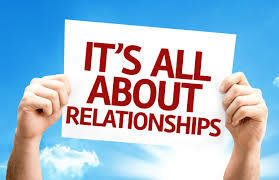 This month I’m talking about relationships. Some of my biggest annoyances yesterday came from people that I’m supposed to have a good relationship with. A company I do business with frequently and yet still seems to disappoint. Business partners who are really not acting like partners. At the root—-what’s the issue? Well in these two situations—communication, or lack there of. It’s when people don’t think of who else needs to be told something or simply not reading a request fully and then not fulfilling the request because—well—-obviously–they didn’t read. In a world full of choices, small things matter when it comes to who we want to have a business relationship with. Things like trust that comes from doing a job right and well the first time. Or taking into consideration information someone else needs to do their job. But, alongside those two instances was the business partner who exceeded my expectations–by going above and beyond what I asked and communicating along the way. And there was the teammate who stepped in to help just because that’s who she is and what she does! That’s it—we can always choose to look at who’s not doing what we expect. Perspective is knowing that there’s always two sides to every issue. And, when there’s something wrong…there’s usually something right.